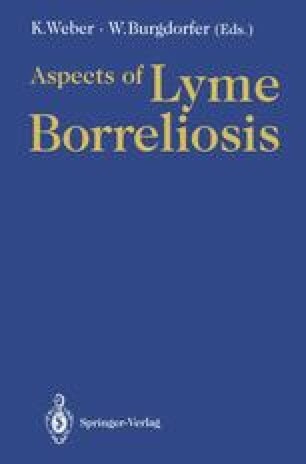 Antibiotic therapy is considered the mainstay of treatment for joint manifestations of Lyme borreliosis. However, many questions remain unanswered, and many difficulties hinder the approach to therapy; for example (a) Large-scale placebo-controlled treatment studies are lacking; (b) uncontrolled or comparative studies do not take spontaneous remissions into account; in the report by Steere et al. (1987) of 21 untreated patients with Lyme arthritis, the number of patients with attacks of arthritis decreased by 10%–20% each year; (c) criteria for judgement of treatment success or failure are defined arbitrarily and heterogenously; and (d) there are uncertainties in the diagnosis of Lyme arthritis and, in particular, as regards arthralgias due to borrelial infection.